E-commerce solutions and Analytics are becoming the next big thing. According to a study published by Frost and Sullivan in November 2014, the B2B and B2C e-commerce market will grow to $9.9 trillion in gross merchandise value by 2020. These predictions should obviously, like all forecasts, be approached with a certain level of wariness. Yet it is certain that e-commerce is a steadily growing market surfacing as a topic of interest not just for the budding entrepreneurs, but also for corporations. With the prosperous future of the market, more and more companies are deciding to include e-commerce solutions in their websites. 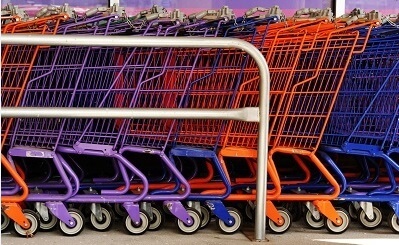 So if one day you need to jump on the e-commerce bandwagon, fear not and read on. We’ll lay out the 4 most important steps and points you need to consider when implementing e-commerce functionalities. Step1: Simply start with a shopping cart! What kind of products will your company sell – digital or physical? What is the size of your inventory? How will you handle payments and shipping? Will you want to integrate it with other tools you already use? The next vital thing will be a decision whether you want your cart to be hosted on your website or on an e-commerce platform. In other words, you’ll have to decide whether a self-hosted or hosted solution will be better. Explaining which of these two will work best for you is obviously complex, but let’s now focus on the main differences that need to be taken into account. Step 2: Should you go for a self-hosted or hosted solution? Self-hosted e-commerce solutions will provide you with the most control and customisation. However, they will require more involvement and effort, such as server maintenance and security. You will be responsible for protecting your customers’ data and keeping the software up to date and functional. Some of the most popular self-hosted platforms include: WooCommerce, Magento, OpenCart, OsCommerce, PrestaShop, XCart, SpreeCommerce, VirtueMart, Drupal Commerce. Hosted e-commerce solutions may seem to give you less freedom and may be less tweakable, yet they are chosen by many companies searching for stability and reliability. Using hosted solutions minimises the chances of your store crashing and even if something goes wrong, you will always have a dedicated support team ready to help you. If you know that you will not have the time or resources to take proper care of the technical side of your company’s cart, then you should probably go for the hosted solution. A major drawback is that you will have to pay a monthly fee, and depending on your particular needs, this may turn out to be quite pricey. Examples of hosted e-commerce solutions include: Shopify, Volusion, BigCommerce, Yahoo Store/Yahoo Small Business Ecommerce, 1ShoppingCart, Wix, X-Cart Cloud, 3dCart, PinnacleCart, Etsy. So as you can see, there’s quite a range of e-commerce solutions. We highly recommend you to have a look at open source carts, as they contain a nice combination of features at a minimal cost and can be developed to fit the needs of your company. Although open source e-commerce solutions may not provide the same amount of hands-on support options that many proprietary platforms provide, they usually have large communities of developers and partners to help new users. Another really important decision you need to make quite early is which analytics solution to use: you want to choose well now and avoid headaches in the long run. E-commerce analytics software provides you with data necessary to make informed decisions about how to grow your business. You will need a stable and secure solution that will allow you to analyse revenue, track orders, conversion rates, average order values, abandoned carts and detailed product statistics. Software that would let you learn about the most important metrics of each transaction, see the most popular products and the ones with the highest conversion rates and view a detailed e-commerce log in real time. You will probably also want to analyse the type of visitors that have made a purchase and see the users who have abandoned their shopping cart with products left in them. 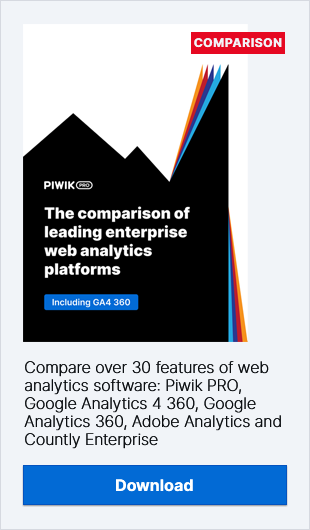 With open source tools like Piwik, you get the benefits listed above plus some more advanced e-commerce analytics features for free. One of the most valuable e-commerce features found in Piwik PRO is Goal Tracking. This feature enables you to measure the actions of your website’s users that align with your priorities and strategy. It can entail many things: Sold item, New customer signup, Download offer, etc. You can break down the purchases, conversion rates and revenue by many dimensions such as traffic sources, geolocation, marketing campaigns and many more. Leran more about E-commerce analytics from our Ultimate User Guide. 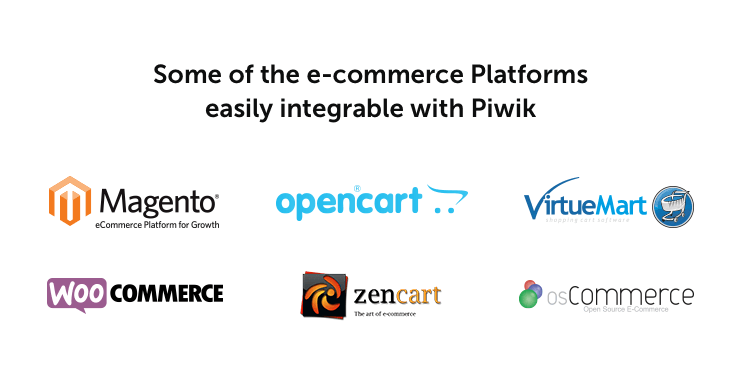 Whichever type of online cart you decide to go for – hosted or self-hosted – you will be able to integrate Piwik PRO e-commerce functionalities with it easily and smoothly. Going for a hosted e-commerce solutions such as Shopify or BigCommerce means that it can be seamlessly integrated with Piwik PRO – a secure and cost-effective hosting for your analytics data. When using popular ecommerce software platforms such as Magento, Prestashop, Zen Cart, Oxid, VirtueMart or osCommerce, you will most likely find the ready-to-use Piwik PRO Plugin that will install the tracking automatically on your pages. Learn more about e-commerce solutions of Piwik PRO. And that’s it – you’ve just completed all of the 4 steps needed to implement e-commerce solutions. Give it a go and enjoy! The Piwik PRO Team specialise in providing secure and cost-efficient cloud hosting and enterprise analytics consultancy to users of Piwik. Discover what Piwik PRO services can do for your business.